For years, it was an October tradition in our neighborhood to drop in at my friend’s preholiday arts and crafts sale. 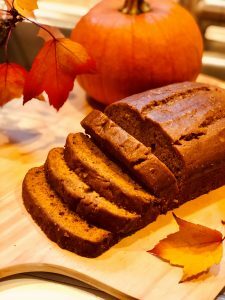 Opening the heavy front door of her turn-of-the-century home, we were drawn in from the outdoor chill by the aroma of warm, freshly baked pumpkin bread served on trays in the dining room. Looking back, I now wonder if people came for the pumpkin bread as much as for the art being sold. This updated, foolproof recipe is moist, full of enticing autumn spices we love, and it’s super-easy to make and bake with kids. No mixers or tricky steps. Just measure, whisk, stir and bake. Of course, you may put your own spin on the recipe and add chopped nuts and raisins to the batter, or even drizzle icing with a sprinkling of pepitas (a type of pumpkin seed) on top of just-baked bread to make it fancy. To prepare oven: Heat oven to 350 F.
To prepare pan: Place a piece of parchment or wax paper on the bottom of a greased 9-by-5-by-3-inch loaf pan. To prepare batter: Whisk together oil, sugar, eggs and pumpkin in a mixing bowl. Meanwhile, in a separate bowl, sift together flour, cinnamon, cloves, allspice, nutmeg, salt, baking soda and baking powder. Stir dry ingredients into wet ingredients alternatively with the water. Avoid overmixing. To bake: Bake in middle of oven for 60 minutes or until wooden pick or knife inserted in center comes out clean. Cool for 10 minutes and turn out onto a cooling rack to cool completely.